Women in prehistory, who made this hand impression? Today Archaeology Magazine shared an article about archaeology and cultural history in Borneo. The region is rich with traditions and heritage, not to mention a stunning and unexplored archaeological record. What caught my attention, however, was a description of vessels called “dragon jars,” which are keepsakes that sometimes store wine or rice. They also have been store to hold bones of the deceased human, organized in cemeteries. Civilizations and cultures from around the world have unique ways of honoring and storing their dead. Durkheim arguses that funeral rituals strengthen social ties and reinforce the social structure of a group by calling forth feelings of togetherness and social solidarity. Culture, and funerary rites, are also semiotic, embodied systems of symbols and patterns that people create in order to understand their world and elucidate why things happen the way they do (see Clifford Geertz). 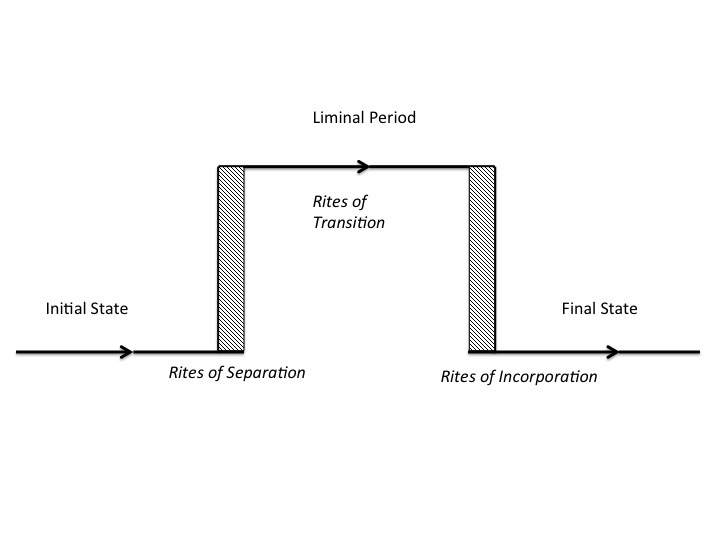 Geertz also coined the concept “Rites of Passage,” which states that individuals go through three phases after the death and burial of an individual: Separation, liminal period, and the final state representing the rites of incorporation. Peter Berger describes death is an extreme example of a crisis that threatens to bring about the collapse of our socially constructed world, emphasizing the unstable, precarious quality of human life. Across the world, a general message encoded in mortuary rites is that death is not final, nor is it the complete destruction of a person (Danforth, pg 31). Rather, the living use the death of a community member to negotiate and reaffirm the values and ideologies of their society. The myriad of death rites through time and from around the world demonstrate how humans have constructed fascinating and beautiful ceremonies to honor their deceased and help community members recover from the loss of a human life. In Loring M. Danforth’s book “The Death Rituals of Rural Greece,” Loring takes an anthropological approach to document the unusual funerary rites of the town of Potamia. The community members engage in a long mounting period. Beginning with the funeral itself, the women openly and loudly lament the death of their family and community member. Once the deceased is buried, women (usually female family members, especially the mother), visit the grave daily, adorning it with trinkets, candles, and photographs. After a year has passed, the community digs up the grave and opens the casket. The community and family members comment on the “whiteness” of the bone, believing that an individuals’ “whiteness” denotes how pure and good the person behaved during life. The bones are wrapped in a cloth, put into a box, and the placed in the town ossuary as a final resting place. These practices recorded by Danforth are actually similar to rituals preformed by ancient Greeks. 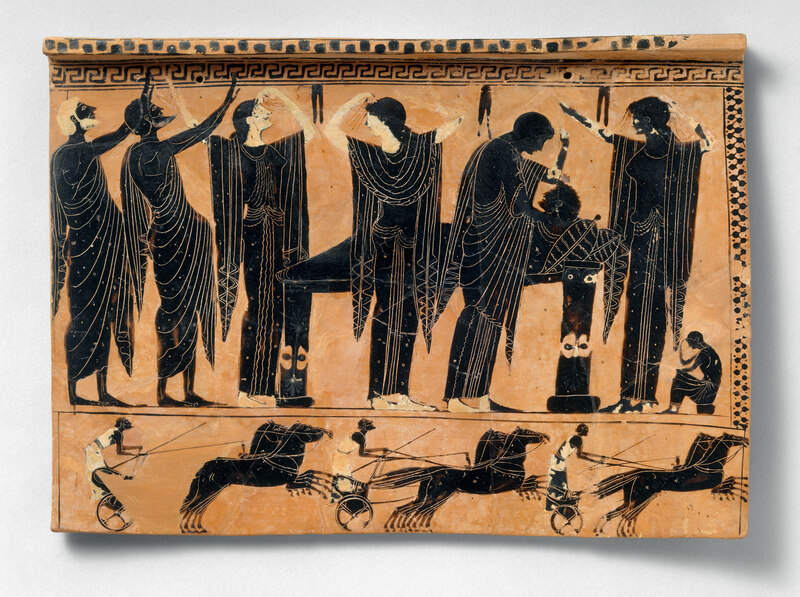 Funerary plaques often depict the prothesis, or the laying out of the dead, showing women engaged in raucous and passionate laments, waving their warms, tearing out their own hair, and with mouths open and head facing skyward, as if shouting out in distress. Additionally, the Greeks would adorn objects to the graves of the deceased. 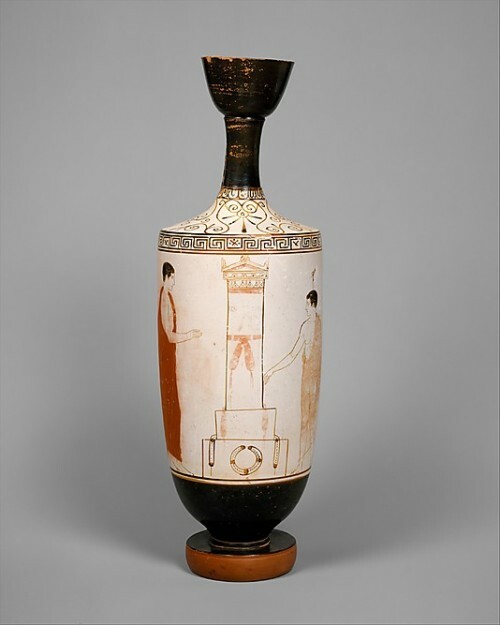 Greek lekythos showed that women had the responsibility to visit and abroad the grave. Each object would have a symbolic meaning. For example, mourners would tie ribbons and wreaths to the grave, that might have been a way to heroize the deceased, as ribbons and wreaths were used to heroize winners of athletic competitions. The Wari’ are a small-scale society located deep in the Amazonian rainforest. They were one of the last groups of people to ritually practice cannibalism. When an individual died, the Wari’ would consume the flesh of the deceased. Many anthropologists thought that the Wari’ did this out of aggression, disrespect for the individual, and even as a way to consume more protein. Death rituals among the Wari’ ultimately served to help the community confront mortality and cop with the loss of a community member. Much like the Greeks, the Wari’ enacted their own rites of passage to negotiate community ideology and overcome the uncertainty of death. Sky burials have been practiced for more than 11,000 years in parts of the Near East (e.g. Turkey) and Asia (e.g. Mongolia, India, China). Scholars debate the origins of the practice, some suggest that the practice derives from a form of Buddhism, and others opine that it was merely a practical way to put the deceased to rest. Basically, the body would be placed on a mountain top, allowing for flying scavengers to consume the body’s flesh. The sky burial was meant to represent the impermanence of the human body. It was not the earthy shell that matters, but the soul, which is released from the body at the time of death. According to Buddhism, when a human dies, he or she is likely to return to as an animal. So the sky burial is a chance for the living to provide food to sustain other living animals, like vultures and other scavengers. Not a lot is known about the origins of sky burials. In the 1960s, China outlawed the rituals, only to legalize it in the 1980s. Only family members are allowed to witness the burial; outsiders cannot view the close and intimate ceremony. Based on what we know about the practice, much like the Wari’, the mourners do not share Western and Judo-Christian notions of preserving the body’s comportment (i.e. so the dead could be called from their graves at the second coming of a savior). Instead, the sky burial allows the mourners to reaffirm their ideology and take comfort that their soul will live on outside the human body. Funerary rites and images can also demonstrate the ways in which cultures intersect. 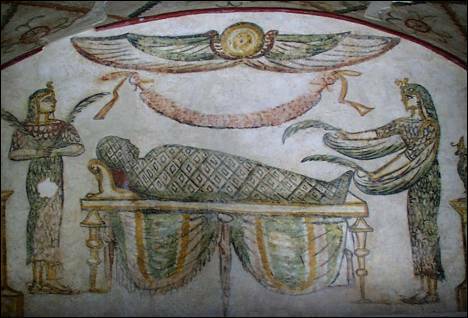 In the painted programs in Greco-Roman tombs in Alexandria, one expects to see the tombs display images related to Classical mythology. Instead, the deceased are surrounded by images of candelabras and bucolic landscapes as well as traditional Egyptian ceremonies and gods and goddess. In the Tigrane Pasha Street Tomb, the scene depicts a crucial moment in the Isiac initiation when the initiate is symbolically mummified. After the ceremony, the individual is unwrapped and reborn again into his or her new cult. The mummy is not accompanied by the traditional attributes one expects to see during an Egyptian embalming ceremony; Anubis is not present in the scene; and all canopic jars are also missingIsis is an Egyptian goddess, however the images style is clearly Greco-Roman. Additionally, the figure on the viewer’s left is standing in an almost contrapposto pose, one foot facing forward with the knee bent slightly. Egyptian imagery always displays the figures in a flat, one-dimentioal profile. The figures in the Tigrane image, however, are almost rendered in a two-dimensional manner. The conflation of imagery suggests that the living were attracted to the traditional Egyptian images for the exotic characters and meanings, yet wanted to maintain their homeland’s traditions. Funerary rites were used to reaffirm their allegiance to their homeland’s traditions, along with political alliance and cult membership, while infusing the space with the exotic, new traditions of a strange new world. Archaeologists working in Borneo will undoubtedly discover a rich history of beautiful and nuanced funerary traditions that allow the living to mourn while send their loved ones onto the afterlife.